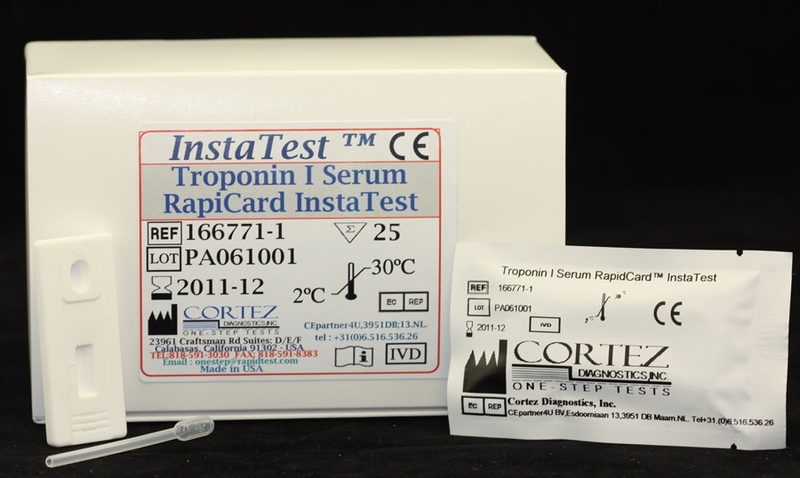 Troponin I Rapid Test Serum/Whole | CE-GMP | 818-591 3030-USA. Diagnostic Automation offers One-Step Troponin I RapiCard InstaTest TnI test is an immunochromatography based one step in vitro test. It is designed for qualitative determination of cardiac troponin I (cTnI) in human Serum /Plasma /Whole Blood specimens as an aid in the diagnosis of myocardial infarction. 2. Serum: Vacutainer tube, without anticoagulant. Troponin I (cTnI) is a cardiac muscle protein, together with troponin T (TnT) and troponin C (TnC), TnI forms a troponin complex in heart to play a fundamental role in the transmission of intracellular calcium signal actin-myosin interaction. The human cTnI has an additional amino acid residues on its N-terminal that are not exist on the skeletal forms thus making cTnI a specific marker for indicating cardiac infarction. cTnI is released rapidly into blood after the onset of acute myocardial infarction (AMI). Its release pattern is similar to CK-MB (4-6 hours after the onset of AMI). However, CK-MB level returns to normal after 36-48 hours, while levels of cTnI remains elevated for up to 6-10 days. The level of cTnI is very low in normal healthy people, and not detected in patients with skeletal muscle injury. Therefore, cTnI is a specific marker for diagnosis of acute myocardial infarction. The Troponin I Rapid Test is a sandwich immunoassay where the antigen is sandwiched between two antibodies. 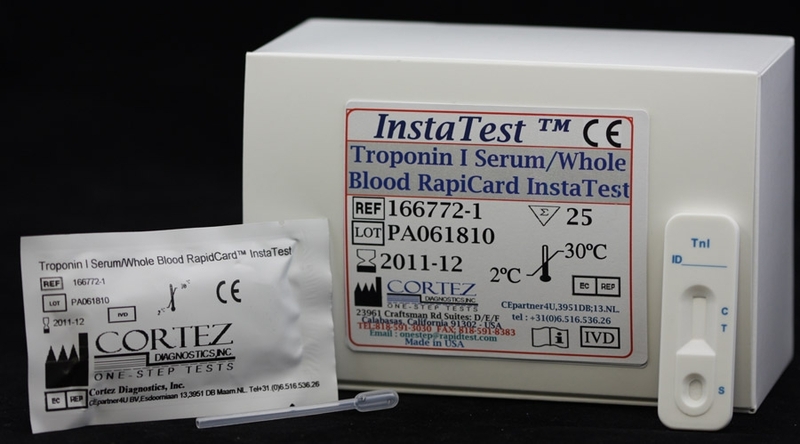 The Cardiac Troponin I Rapid Test kit comes in cassette format and is highly sensitive and specific. Specimen collection and preparation instructions are easy to follow. When sample is added to sample pad, it moves through the conjugate pad and mobilizes gold anti-cTnI conjugate that is coated on the conjugate pad. The mixture moves along the membrane by capillary action and reacts with anti-cTnI antibody that is coated on the test region. If cTnI is present at levels of 0.11 ng/mL ( Bayer ACS: 180 ) or 1.5 ng/mL (Abbott AxSYM ) or greater* , the result is the formation of a colored band in the test region. If there is no cTnI in the sample, the area will remain colorless. The sample continues to move to the control area and forms a pink to purple color, indicating the test is working and the result is valid. 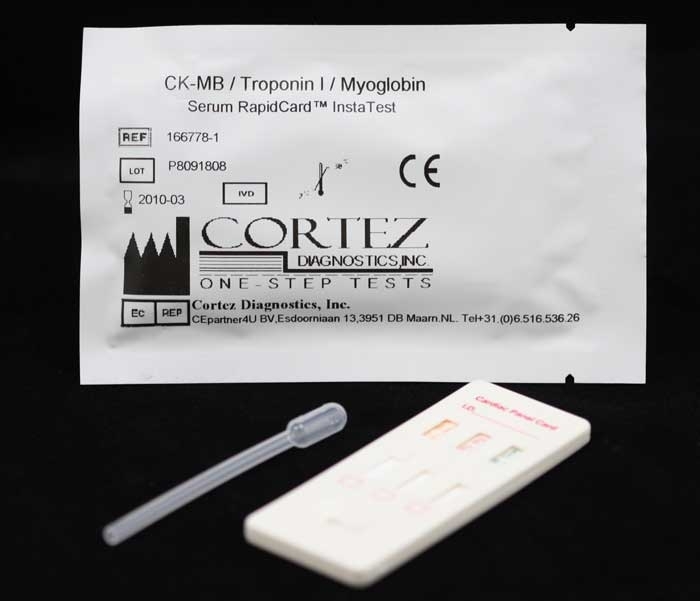 The One Step Troponin I Rapid Test is safe, accurate, and quick. Results are obtained in less than 15 minutes. See Product Insert for more details on test preparation, procedures, and evaluating results. 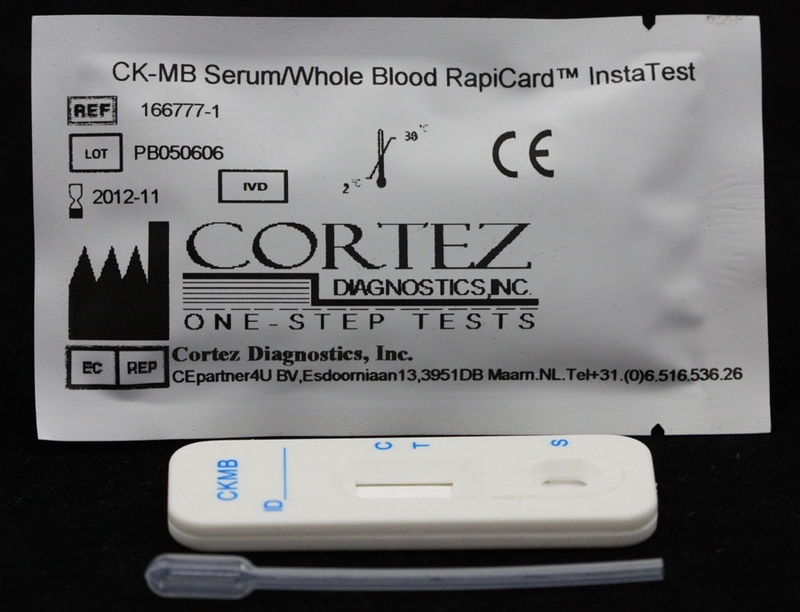 Diagnostic Automation Inc. offers an additional TnI Rapid Test for Serum specimen. 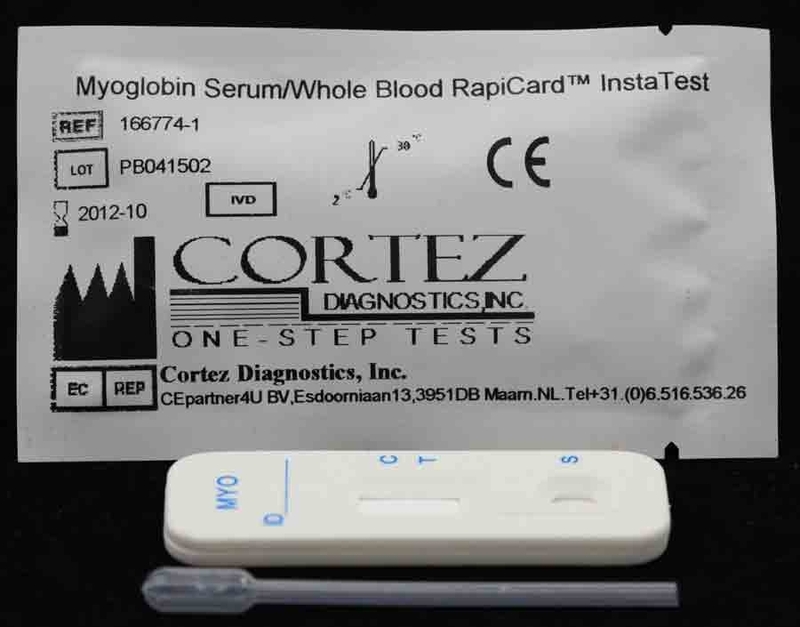 Other Cardiac Markers Rapid Tests such as Myoglobin Rapid Test, the CRP Serum Rapid Test are available, along with Cardiac Markers ELISA Tests. Please see our home page product list, or contact our Customer Service Representatives for more information.